While trading is a difficult endeavor, it's still possible to make money doing so in today's markets. The real question is: how can you achieve this goal? What is required is adapting a successful existing business model to this speculative arena. The model that makes most sense is the "casino paradigm" and nobody understands it better than author Richard Weissmana professional trader with over fifteen years of experience consulting and training traders and risk managers. And now, with Trade Like a Casino, he reveals how successful traders tend to operate like a casino in that they develop a method that gives them "positive expectancy" and then unflappably implement their approach in the face of changing, and oftentimes volatile, market conditions. 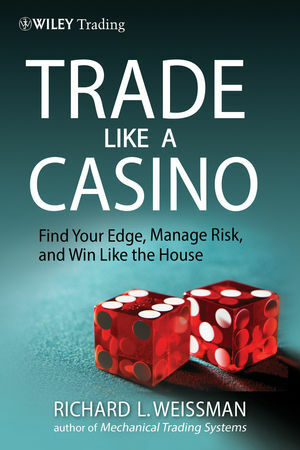 Page by page, this reliable resource explores the intricacies of methodology, mental control, and flexibility that allow traders to develop and maintain a casino-like edge. It also addresses some of the more complex issues that surround this model of successful speculative trading. Successful traders don't need luck, since they consistently play the probabilities and manage risk. That's how casinos win, and with this book as your guide, that's how you'll learn to win in today's dynamic markets. RICHARD L. WEISSMAN is a trader, trading system developer, and educator on trading and risk management. As senior associate with the Energy Management Institute, he holds seminars and webinars for professionals on trading and risk management. Weissman is a former member and trader at the New York Futures Exchange. He has written articles on trading and technical analysis for a variety of industry publications and provides independent consulting services to traders and risk managers on technical analysis, derivatives, and trading system development. Weissman is also the author of the Wiley title Mechanical Trading Systems.